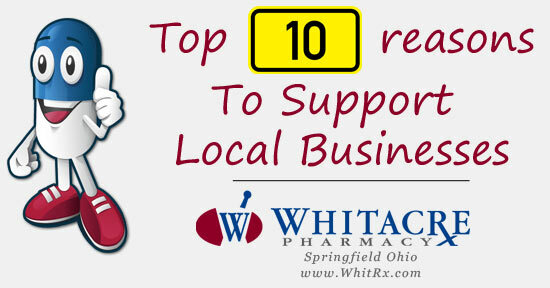 Whitacre Pharmacy supports a variety of local organizations in the Springfield Ohio area. We understand how important it is that all of us in our Springfield Ohio community show support for local businesses. Whitacre also sponsers and supports many local orginizations, and have been for over 100 years! Here are some of the top 10 reasons to show why it helps us all to support local business. Local Character and Prosperity - In an increasingly homogenized world, communities that preserve their one-of-a-kind businesses and distinctive character have an economic advantage. Community Well-Being - Locally owned businesses build strong communities by sustaining vibrant town centers, linking neighbors in a web of economic and social relationships, and contributing to local causes. Local Decision-Making - Local ownership ensures that important decisions are made locally by people who live in the community and who will feel the impacts of those decisions. Keeping Dollars in the Local Economy - Compared to chain stores, locally owned businesses recycle a much larger share of their revenue back into the local economy, enriching the whole community. Job and Wages - Locally owned businesses create more jobs locally and, in some sectors, provide better wages and benefits than chains do. Entrepreneurship - Entrepreneurship fuels America’s economic innovation and prosperity, and serves as a key means for families to move out of low-wage jobs and into the middle class. Public Benefits and Costs - Local stores in town centers require comparatively little infrastructure and make more efficient use of public services relative to big box stores and strip shopping malls. Environmental Sustainability - Local stores help to sustain vibrant, compact, walk-able town centers-which in turn are essential to reducing sprawl, automobile use, habitat loss, and air and water pollution. Competition - A marketplace of tens of thousands of small businesses is the best way to ensure innovation and low prices over the long-term.